William Caxton depicted in a stained-glass window in the crypt of the Guildhall. Until the latter part of the 15th century all books had to be written by hand. In earlier centuries parchment was used but by the end of the 14th century paper was being imported, some from Genoa and later from France and the Rhine region. The printing press is thought to have been invented in Germany by Johannes Gutenberg around 1450 and by the end of the century printed books were available in London. 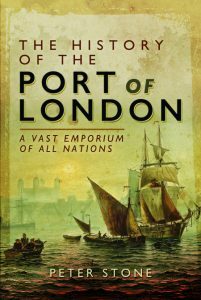 At the end of the 1460s the Earl of Worcester arranged for the Hanseatic League at the Steelyard – the Germanic traders who had their London base where Cannon Street station now stands – to acquire two printed bibles for him and some merchants began importing quite large quantities of books to England. Around the end of the 1470s Henry Frankenburgh was importing hundreds of historical books and Peter Actors was also shipping similar quantities. The first person to bring printing to England was William Caxton. He was born in Kent, possibly around 1422, and at the age of sixteen came to London to become an apprentice to a mercer. He then moved to Bruges, the centre of the wool trade, where he eventually became a diplomat for the King. At the request of the Duchess of Burgundy, sister of Edward IV, he translated The Recuyell of the Historyes of Troye. In the 1470s Caxton spent time in Cologne where he learnt the art of printing. Returning to Bruges he set up a press and in 1474-1475 published his translation of The Recuyell, the first book to be printed in English. In 1476 he returned to England where he set up a press beside Westminster Abbey at the Sign of the Red Pale. The following year he published the first English-language book to be printed in England, Dictes or Sayengis of the Philosophres. Caxton not only published and printed books but built up a trade in those he imported from the Continent. Although he was based at Westminster many of his customers were the merchants of the City of London. Customs records show that in 1488 alone he imported over one thousand books within a two month period. Other than Caxton there were very few booksellers in London until the following century although legal and education books were imported by the Lithuanian John Lettou and his partner William de Machlinia. During his lifetime Caxton went on to publish around one hundred books, many of which he translated into English using his knowledge of French, Latin and Dutch. His most famous printed work is Chaucer’s Canterbury Tales. Caxton’s printed books are notable for their craftsmanship and careful editing. One of his early popular publications was The Game and Playe of Chess. With many of his customers being from the middle classes the works he published were often popular translations – “small storyes and pamphletes” – such as Reynart the Foxe, unlike the classical texts from the Continent, although some were large and sumptuous volumes. Caxton was also an active parishioner at the Abbey and often audited the church accounts. He died around 1491 and was buried at St.Margaret’s church at Westminster. When Caxton arrived at Westminster with his printing press he brought with him his assistant Jan de Wynkyn. After Caxton’s death de Wynkyn – more commonly known as ‘Wynkyn de Worde’ – set up his own business on the west of the City, conveniently situated between Westminster, the Inns of Court, St.Paul’s and the City. De Wynkyn’s shop at the Sign of the Sun in Fleet Street began a long-lasting association with printing in the vicinity of St.Paul’s, which continued in Fleet Street until the late 20th century.